Other photos: Manufacturer photo, Manufacturer photo, Manufacturer photo, Manufacturer photo, Starboard profile, Starboard view, Port view, Passerelle and Tender, Manufacturer photo, Manufacturer photo, Manufacturer photo, Looking forward from bridge, Bridge helm, Bridge helm, Bridge wet bar and grille, Bridge seating, Aft deck seating, Aft deck seating, Stairway to bridge, Stairway to bridge, Lower helm, Salon looking forward, Galley, Master stateroom, Master stateroom, Master vanity, VIP guest, Guest cabin, Master head, Head, Master shower, Engine room, C18 ACERT - 1100HP, Mase generator, AC chiller, AC chiller. This beautiful Aicon 56S is located in the Tuscany region of Italy in Punta Ala and ready for a new owner. She is fully equipped and very well maintained by very knowledgeable owner. And this 56 has the C18 ACERT 1000 HP Cats with very low hours and she is Fast! Cruise at 30 knots and top out at 36! She has 3 staterooms plus crew, large salon and lower helm. 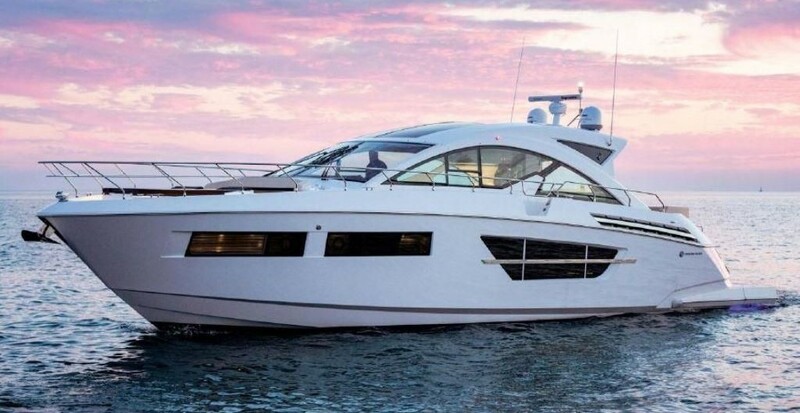 Fitted with the latest Raymarine electronics new in 2014, bow thruster, Sat TV, Cat electronic controls, fold back Bimini, tender and passarelle. Owner moving up to larger yacht and wants her sold now. He says bring offers!